Power BI and Power Pivot are a common catch phrase these days, as is BIG data and data scientists, but exactly what is Power BI, what does it mean, and how can your organization benefit by using it? Power Pivot is the most known and is widely used. One of the projects we did for Microsoft was based on a Power Pivot solution. But What is “Business Intelligence”? Business intelligence might sound like one of those useless buzz terms that get thrown around in the corporate world so much, but it’s actually a very useful concept. It’s the ability to look at a bunch of information and find the important patterns, signs and lessons to be learned from that information so you can do something worthwhile with it. (Click here to learn more). Microsoft’s Excel’s Power BI is made up of several of Microsoft’s applications/components. A quick summary of each is below, followed by more details on Microsoft Excel’s Power BI. 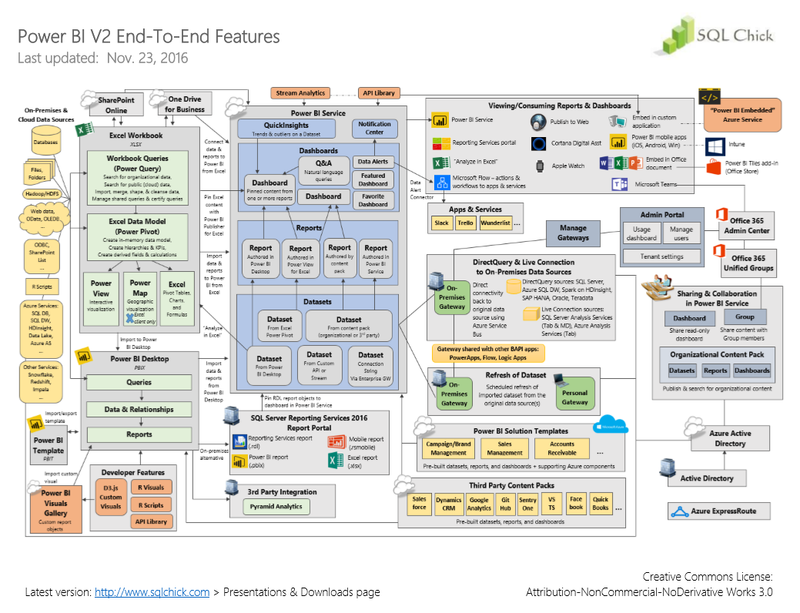 In addition there is an attachment that has a great diagram on the Power BI end-to-end features. Azure is Microsoft’s trademark cloud service that provides IAAS, PAAS and SAAS simultaneously. SharePoint is Microsoft’s organization focused intranet service that is either on premises or cloud based. SQL Server is either a client or server on premises application or Azure hosted application. 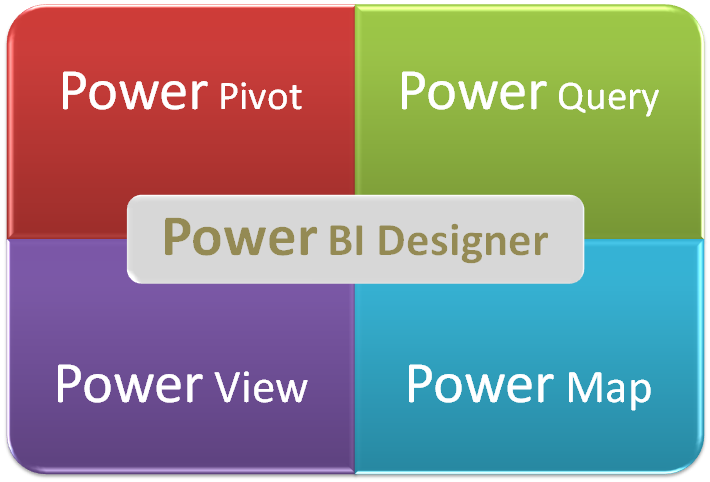 Microsoft’s Power BI (comprised of PowerQuery, PowerPivot, PowerView and PowerMap) is really a multitude blend of all of these components. It is either a client or server on premises application (Power BI Desktop or Microsoft Excel 2013/2016) with the ability to Publish directly to powerbi.com (given One Drive for Business is setup for Microsoft 2016). At the same time, it connects to powerbi.com (Azure hosted with powerbi.com Groups connected automatically to SharePoint libraries). Also, SQL Server is integral because Data Models are essentially SSAS Tabular Models and Microsoft’s SQL Server allows any Data Model to be easily restored to Analysis Services for as fully independent on premises/server/cloud instances. custom tailored to fit specific client needs. It’s simply key to understand the benefit of each component in any final solution. encapsulates the breadth and depth of the BISM end to end. Microsoft Excel Power BI (Power Pivot) and Business Intelligence in general is about getting business data to the right people at the right time. Business data is essentially people, product and place details of that data set. A key tool for many successful business is its ability to intelligently research its market and customers. Without the ability to know who your potential customers are and what they really want, you can’t make optimal business decisions. We know how complicated this may seem, and we understand that you do not need to be a Power BI expert to benefit from it, all you need to do is to hire a firm like ours, because we completely get it. Need help with your Power BI solutions? We are here to help.